A campus security officer at a Minnesota college accidentally shot himself in the shoulder Tuesday night, and because he was afraid that he would get in trouble for the incident, he made up a story about a black gunman to cover up his mistake. The Star Tribune reports that St. Paul police were immediately skeptical of 25-year-old Brent P. Ahlers’ story that he had been shot by a black gunman in a navy blue sweatshirt with a short Afro, so they did not publicly share the description of the supposed shooter. 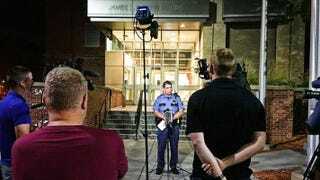 The campus of St. Catherine University, however, was still put on lockdown for hours as 55 police officers, four K-9 units and Minnesota State Patrol aircraft searched for the alleged suspect. Ahlers, who is white, told police Wednesday that he made up the story because he was afraid of losing his job at the Catholic university for women, where firearms are not permitted and not issued to security personnel. He was arrested Wednesday night and cited for falsely reporting a crime, which is a misdemeanor. After being treated for a shoulder wound, he was booked into the Ramsey County jail and released on his own recognizance at 4:30 a.m., according to the Pioneer Press. Ahler’s case has been presented to the city attorney’s office to be considered for charges above and beyond the false-report citation. I want to update the community on two aspects of the issues raised in connection with the St. Catherine University Department of Public Safety officer who falsely reported having been shot on campus Tuesday night. First, as you know, Brent Ahlers was put on paid leave September 13 while the St. Paul Police conducted their investigation and the University completed a review of the facts. That status has now changed. He is no longer an employee of the University effective today, September 14. Second, I want to be clear that St. Catherine University strongly condemns racial discrimination, racial stereotyping, and racial profiling of any kind. The statements attributed to the former employee concerning the race of an alleged suspect are deeply troubling and do not reflect our values. Meanwhile, black leaders spoke out Thursday morning after news broke that Ahlers had confessed to making up the whole thing. Dianne Binns, president of the St. Paul NAACP, told the Star Tribune that Ahler’s decision to describe the nonexistent suspect as a black man is rooted in the racism that perpetuated slavery and the oppression of blacks for hundreds of years. Read more at the Star Tribune and the Pioneer Press.